Home > Special Articles > No Indian City on JLL’s List of Top Successful Ones – What Lessons Can We Learn? No Indian City on JLL’s List of Top Successful Ones – What Lessons Can We Learn? 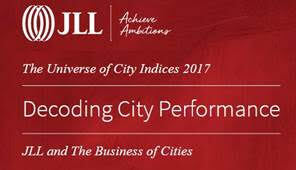 JLL’s annual research report ‘Decoding City Performance: The Universe of City Indices’ covers more than 300 city indices in the world that measure all aspects of city life. JLL Global Research has partnered with Business of Cities, a city intelligence and strategy group, to crunch 44 of the most robust indices. These indices have a bearing on how we understand city dynamics, and serve to guide investors and businesses as they make location choices. In this year’s edition of the report, the top cities of the world once again contend for being the most successful and the results yield important insights into the new world order. In 2017, London and New York lead the pack among the ‘Big Seven, followed by Tokyo, Paris, Hong Kong, Singapore and the newest entrant – Seoul. These top tier cities score highest on over 300 performance metrics. Indian cities are notably absent even among the ‘10 Contenders’ which follow closely on the heels of the big seven. This year, the cities identified in this category are China’s alpha cities Beijing and Shanghai, the New World Cities of Amsterdam, San Francisco, Toronto, Madrid and Sydney, and the U.S. alpha cities of Los Angeles, Chicago and Washington DC. Four Asian cities do appear on the list – but the stark fact remains that not a single Indian city makes the cut. India doesn’t even feature in the top 30 of the list. In fact, only two cities from the BRICS nations are on the list - and both are from China. The underlying fundamentals of the report are the performance metrics - the parameters used to rank and rate theses cities to compete with each other. So, why does the world’s fastest-growing economy, which has the second-largest workforce of 513.7 million and is the second-most favoured outsourcing destination in the world, not have a single city in the top world order? As the digital economy dominates, cities with robust technology and innovation-centered economies will stand the highest chance of succeeding. Real estate in India must adapt to this new reality, where technology firms with more flexible workforces, substantial digital requirements and 'asset-light' strategies are becoming drivers of absorption. Indian developers must attend more to the diverse types of commercial space requirements in this rapidly-changing world - including laboratories, accelerators, incubators, co-working spaces and flexible workspaces. Real estate is being used explicitly as a draw for talent. Strong talent attraction and development provides a solid basis for future progress, and India is way behind on the curve. The key is improving on education systems, student environments and expatriate talent attraction. Businesses now display an unprecedented focus on talent. India Inc. must concentrate harder on talent attraction - and the equally important aspect of talent retention - by ways of innovative workplace designs and amenity provision. Infrastructure investments are key to unlocking new areas of opportunity for the real estate sector, as they transform the attractiveness of locations by improving connectivity to other important hubs. Infrastructure not only encompasses transport, utilities, telecoms and logistics but also digital connectivity - a critical determinant of how a city can accommodate future growth. Cities that have under-invested in their metropolitan infrastructure are now falling behind. With Metro deployment, its Smart City projects and the Digital India initiative, India’s has taken significant steps. However, we have a long way to go to get to the top. A city's governance is a critical factor in its ability to manage growth and create new opportunities for development and investment. The real estate market is significantly influenced by cities' ability and appetite to build long-term vision, develop clear planning frameworks, rational management and coordination of land use, preparation of investable sites, and willingness to act as development partners. Among real estate investors, the conversation is increasingly shifting to future-proofed, resilient and sustainable cities. Long-term investors like sovereign wealth funds, institutions and pension funds see these qualities as keys to preserving capital over the course of 10-20 years. This is a very clear signal here for India. Our top cities need to get smart, and the upcoming Smart Cities need to be smarter by achieving environmental sustainability and resilience, and becoming clean, green and future proof. Transparency and real estate seldom go hand-in-hand in India, and therein lies our biggest problem. It is a globally accepted maxim that a transparent real estate sector not only facilitates new investments and business activity, but also contributes to community wellbeing and inclusiveness. The recent steps taken in India to overcome this problem are significant. With the demonetization exercise of last year as well as the introduction of the Real Estate Regulatory Act, India has begun navigating out of the murky waters of its real estate market. In fact, the country is all set to improve on its current rank of 36 on JLL's global real estate transparency index. However, the cumulative effects of these reforms have yet to materialize into visible benefits which can help Indian cities rank among the world's best-rated ones. India is home to the world’s second-most expensive real estate market of Mumbai, which is not something to celebrate. According to a RBI report, Mumbai’s housing price-to-monthly-income ratio is the highest among major Indian cities - a staggering 67 times. This obviously makes Mumbai unaffordable for most of its inhabitants. We must factor in here the potential tipping point at which the lack of affordable housing outweighs the potential benefits of being in a city, effectively restricting its talent pool. The affordability of operating a business is another element, in terms of both real estate and staff costs. In an environment where companies are looking more forensically at their portfolios in order to increase efficiencies and reduce costs, cities like Mumbai have a lot to answer for. Though some states like Gujarat, Rajasthan and Uttar Pradesh are investing in brand building for tourism, it is a far cry from what a solid brand should look like. Many global cities are employing consulting firms to boost their brand appeal to distinct audiences. There is also a rise of niche identities – cities that have a special association with sport, diplomacy, higher education, nightlife or gastronomy. Among other things, JLL's city indices illustrate the way cities are communicating their distinct offerings, and through unique channels. New cities are emerging as viable and attractive options for both international businesses and investors. It is not just the destinations of interest that are new, but there are also new sources of capital. For example, new sources of capital have emerged from East Asia, including China, South Korea, Taiwan and Malaysia. The growing range of city indices reflects the expanding universe of international business. India’s culture, heritage and its pluralism are its strengths. Though we have the potential to be world leaders in economic terms, the country needs to consciously brand itself as a free, vibrant and dynamic nation. Only when India uses its culture to leverage on its brand will we see accelerated growth in terms of global recognition. The ‘Big Seven’ and the majority of the ‘Contenders’ are already among the world’s largest real estate investment destinations, given that their expanded role as global gateways attracts a wide spectrum of investors. The rapid growth in the number and ambition of JLL's city indices matches the pace of global change - and the way in which businesses, investors, governments and citizens understand the fast-moving world of cities. As a country, India must take cues from each of the winning cities and play on its strengths to ensure that its cities are not just in line with the top tier world cities, but also find representation is the next 'Big Seven'.